This presentation discussed a proposed model and enhanced tools for sharing best practices and lessons learned. Through group discussion, it solicited feedback on additional collaborative techniques for knowledge integration such as peer assist network, knowledge map, idea exchange, and webpage resources. 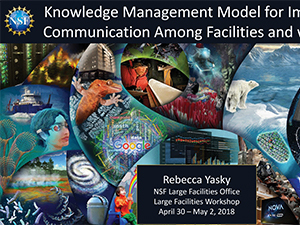 Presented on May 5th at the 2018 Large Facilities Workshop.